If your home or commercial property contains concrete flooring, epoxy floor coating can provide a high level of protection for the floor.There are many benefits to opting for epoxy floor coating, including a long-lasting toughness that can greatly extend the lifespan of your floors, ultimately saving you money. With proper epoxy floor coating services, you can rely on your floors for years to come. At Freshcoats, we offer comprehensive cleaning, coating, and epoxy floor protection services for home and business owners everywhere. Our experts can provide you with the custom, durable solution at an affordable rate. Most of all, our epoxy floor services offer an attractive finish that’s resistant to wear, tear, and damage. What makes our Epoxy floor painting services stand apart from the rest? Minimal downtime for your employees and/or workers. Affordable pricing and budget-friendly rates. Epoxy floor is a type of floor created by pouring epoxy on the floor to obtain the desired thickness. Epoxy floors are used in garages, manufacturing units, warehouses, labs, food industry, hospitals, hospitality industry because they are very easy to clean and are resistant to most of the grease, chemicals, volatile compounds that may fall onto the floor. Epoxy material hardens up and can bear loads and prevent the floor from breaking up or getting chipped. What is the difference between an Epoxy floor and epoxy floor coating? Several layers of self leveling epoxy paint are applied onto the floor surface to a minimum thickness of at least two millimeters. This extra thickness is ideal for high traffic areas and areas that undergo heavy abuse since the flooring will not wear due to wear or abuse. Unlike epoxy flooring, epoxy floor coating usually only has a few layers of epoxy paint applied onto the floor surface. Although epoxy floor coating usually has a thickness of less than two millimeters, it provides better performance than most other flooring materials, particularly where slip-resistance and easy maintenance is needed. Why does the floor have to be prepared for the EpoxyFlooring/ epoxy coating? 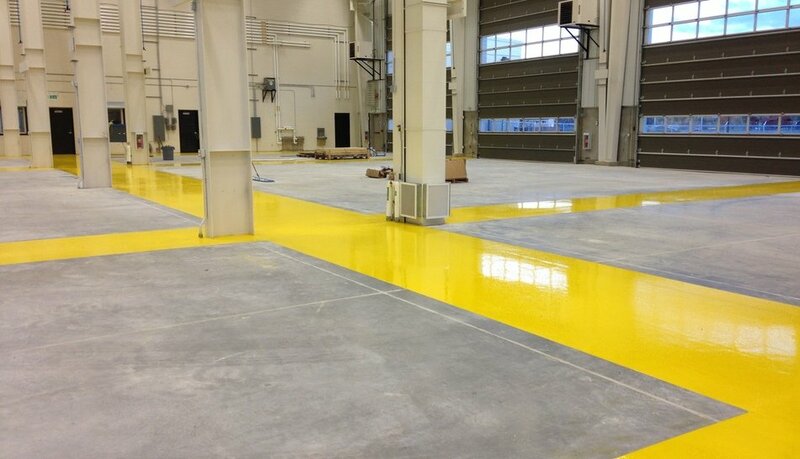 Floor preparation is crucial to the proper application of the Epoxy Flooring system. Epoxy floor coating system will not be able to penetrate and bond to concrete in areas where oil or fluid contamination has occurred. A sprawled or worn floor may have loose mortar and/or an insufficient profile to assure proper epoxy bonding. Do I really need to get this preperation work? Yes. Areas that are not properly prepared will have bonding issues which may cause the epoxy to lift or peel. It is vital that your substrate have a rough, clean surface for the Epoxy flooring to adhere to. The preperation work is the most important part of the entire application. What can I do about the cracks and holes on my concrete prior to applying the Epoxy flooring? Usually all Epoxy product are self leveling and may fill some imperfections, but we always recommend to fill as much as one can prior to applying epoxy floor coatings. You will achieve greater results and have a flawless floor. We have a system to repair the damage. Our method will help you in filling and repairing all types of cracks, holes, and depressions. We use Epoxy fillers and epoxy screed mixtures to fill up the cracks, holes and depressions. Can I put Epoxy flooring over pre-existing paints or other coatings? Epoxy Flooring is not recommended for application over existing coatings because the existing coating will inhibit bonding of the Epoxy Flooring /epoxy coating to the concrete floor. Floors that have existing coatings should be stripped, etched, diamond grinded or shot blasted to remove as much of the coating as possible. In cases where the coating cannot be removed, a sanding of the floor using an orbital sander can provide a “profile” for the epoxy to adhere to. Does temperature affect the application of Epoxy Flooring /epoxy coating? Yes, extreme heat or cold can affect Epoxy floor coating during application Epoxy floor coating is not recommended to be applied when temperature is above 39 degree Celsius and below 12 degree Celsius at the place of application. Temperature controlled indoor places where the variation of temperature is within the recommended limits is perfectly fine, even though the temperature outside may be too high or too low. Can we apply Epoxy on terraces or outside areas? No. Epoxy coatings or floorings can only be applied indoors. Epoxy is not stable to UV radiation and is not recommended for outdoors. Why should concrete in my garage, workshop or lab be covered with epoxy? For a cleaner, easier to clean surface. Concrete floors are porous which promotes the collection of grime, dirt, water, and promotes the growth of bacteria. Our floors are relatively non-porous which inhibits the growth of bacteria. Should I paint my walls before or after I have the floor coating installed? AFTER. If you plan on having the walls of your property painted, we highly recommend on waiting until AFTER the floor coating has been installed before doing so. This is because floor coating may splatter onto your walls during its application and mess up your new walls. I have a lot of stuff in workshop/Factory, do you offer moving services? At this time we do not offer moving services. We respectfully request that all items from the working area be removed and cleared prior to our scheduled arrival for installation. How do you install flooring on a workshop or factory floor when work is happening in that area and that too in multiple shifts? We plan the installation activity in sections after consulting you and understanding your priorities and schedules. Epoxy floor can be installed in sections by creating demarcations and areas experiencing a downtime can be worked upon. I previously had my floor epoxied and now it is peeling, can you fix it? Yes, we can fix your epoxy floor by patching it (although the patch may be obvious if your floor has faded) or we can resurface the entire floor, just give us a call! How much does Epoxy floor cost? It entirely depends on the thickness and the volume of work. Epoxy coatings (not floorings) start at around 40 Rs per Sq ft and Epoxy Floorings start at around 70 Rs per Square feet and can go up depending on the thickness and traffic movement/load bearing capacity that you require. How long after the installation can one use the epoxy floor? Light traffic (walking, moving trolleys) can start after 48 hours. Heavy movement is recommended after 6- 7 days.